Sexual harassment has been widespread in Egypt for decades but since the January 2011 uprising that toppled former President Hosni Mubarak, the problem has taken on epic proportions becoming what rights activists now describe as “an epidemic”. Not only has there been a dramatic increase in the number of harassment cases reported , but the level of violence too, is unprecedented with mob sexual assaults becoming rampant during street protests. No fewer than 91 girls and women were reportedly gang raped and sexually assaulted in just four days during mass protests demanding the ouster of Islamist president Mohamed Morsi last July. Rights activists say the number of assault cases could be even higher as there is the possibility that some cases had gone unreported. Most of the attacks occurred in or near Tahrir Square in downtown Cairo where hundreds of thousands of opposition protesters had gathered to demonstrate against the Muslim Brotherhood president and later, to celebrate his downfall. Vicious mobs used metal chains, sticks , blades and knives to attack female protesters despite the presence of volunteer vigilante groups keeping an eye out for harassers. In response to the surge in harassment, several civil society organisations have sprung up in recent months with the aim of curbing sexual assaults and protecting victims of harassment. One such organisation is the Anti-Sexual Harassment Campaign , an outreach movement set up in November 2012 to keep track of harassment cases and send teams of volunteers to protest sites to intervene in mob assaults. The organisation is just one of several movements monitoring protest sites and offering ‘safety advice’ to women. The emergence of such movements is evidence of the growing unwillingness to tolerate street harassment as public awareness about the problem increases . “Often women victims of harassment are too ashamed to report incidents of harassment and sexual assault. In some cases , they are afraid of getting blamed”, Azza Kamel , founder and director of women’s rights organisation Appropriate Communication Techniques (ACT), said in an interview. “They may feel more at ease talking to another woman about the issue,” she added. Her organisation has run a hotline for eyewitnesses and women victims to report sexual harassment or assault cases which are known to increase and get more violent during public holidays and religious festivals. Fatma Khafagy, chairperson of the National Women’s Council ‘s Ombudsman Office meanwhile, lamented that male security officers do not take sexual harassment seriously enough and at times, themselves harass women who come forward to report such incidents. Victims of harassment often complain of a “culture of impunity” at the state level, saying that perpetrators often go unpunished for their crime. “But that is slowly changing with the growing awareness about the problem,” Khafagy noted. She acknowledged the pressing and urgent need for legislation to counter the problem, given the surge in violence against women in Egypt, post revolution. A study conducted in April by the Egyptian Center for Women’s Rights revealed that 99.3 percent of Egyptian women have experienced some form of sexual harassment. “In the absence of laws against sexual violence, we can only expect street harassment and sexual assaults to continue unchecked”, argued Khafagy. A bill on violence against women that was recently drafted by the National Council for Women and was under discussion in the now-disbanded Shura Council, the upper house of parliament has been shelved due to the political instability. 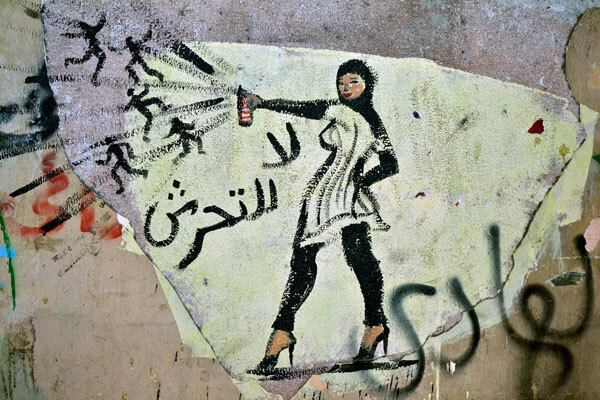 For Egypt’s women victims of harassment, it cannot happen fast enough.